I don’t know if I have shared with you previously, but my star sign is Virgo – some of the characteristics are attention to detail, punctuality and generally a predisposition to order. These characteristics drive my wife nuts, but Hey Ho, that’s the w ay it is. So on a sunny Monday morning off we set, sharply, with a view to driving down to catch the ferry to Arran from Ardrossan. Our dear relatives Philip & Lorraine Giles, from Northern Ireland accompanied my wife and I. As you can imagine the main aim of the day was to visit Arran Distillery, this held particular interest for Philip who is not only a Whisky collector, but fan of the amber nectar from both sides of the Irish ea. As I had, as usual, nominated myself as Captain of the car, I announced on arrival at Ardrossan that we were far too early and should go for a bit of breakfast, so off we popped. We could see the ferry on the horizon and all was well. We duly turned up at the terminal at 10.00 thinking we would be 45 minutes early only to discover, we were alone, no ferry and that we should have been there at 9.45. This I think is the first time I have missed any transport, appointment etc. Poor Jacqueline had to leave the car to contain her laughter, Lorraine was gulping down giggles and I was on the verge of breaking into the full Basil Fawlty tantrum. Determined we were, we rescheduled ferries very quickly as the call to Lochranza was becoming stronger. Once on Arran, which is a beautiful Island, off we set on our quest. We were blessed with a glorious day which gave us an opportunity to really see the Island. On arriving at the distillery we were blown away by the fantastic setting that it sits in and we had been very fortunately to see a Golden Eagle circling high above us. We were warmly welcomed by Campbell who informed that Faye Black (the Visitor Centre Manager) who we thought we would be meeting, was off work, but that she had requested that he looked after us and give us a special tour, but he did say that he had expected us on the earlier ferry. 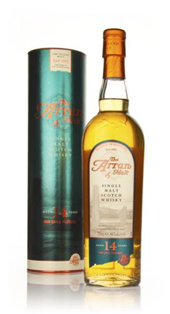 We first popped into the shop to view the Arran range. I got my eye on the Sleeping Warrior which looked very interesting and as I had just had a birthday, I thought I could convince Jacqueline to purchase a bottle for me. Campbell very knowledgeably discussed the virtues of Arrans various expressions. He duly took us around to where the mash tuns, wash backs and stills were, which were all in one room. Campbell also informed us that we would get an opportunity to go into their bond which is not part of a normal tour. On route to the bond Campbell showed us the pond where the distillery discharges its warm water and this is where we saw the resident duck who uses this pond as its personal hot Jacuzzi. So off to view their fantastic bond which had a selection of barrels, some of which had specific names i.e.. hotels, Prince William, Prince Harry and one for Ewan McGregor, Jacqueline has a thing for Ewan, so this delighted her. Once we had fully explored the distillery, we were off again for a taste. Campbell poured us all a dram of the Arran 14 year old, it was smooth and delightful, a grand dram. The girls who are not whisky drinkers enjoyed this dram thoroughly, which is a worry for Philip & I in case they get a taste for malts. Discussion turned to the Sleeping Warrior and Campbell kindly allowed us to try this magnificent dram. I found it complex with a fruity and spicy edge, but will need to have a proper, more intense tasting soon. 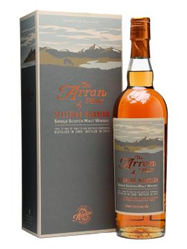 Needless to say Philip & I were so impressed with your drams from Arran it was mandatory that we purchased both the 14 year old and the Sleeping Warrior. 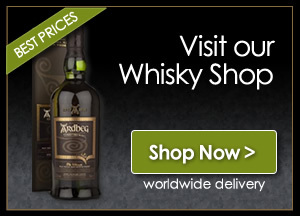 You can buy either of these malts by visiting the Arran Distillery or using our shop window below and buy them online. The day was glorious, the drams were glorious, and the duck was looking good too. I cannot recommend enough that if you get the opportunity to visit the Isle of Arran, you must go to the distillery and sample some fine Whisky. Campbell, we cannot thank you enough for your knowledge, humour and hospitality, by the way, we loved the kilt. I am sure this will not be the last time that I visit the Arran Distillery and would like to wish them all the best with their delightful expressions of fine malts – keep up the good work. P.S. Faye get well soon.